This monumental town is nestled at the foot of Montejurra (the holy mountain of traditionalists) and bathed by the river Ega; it is one of the largest locations on the French route. It was originally a small village called Lizarra (ash), the name by which it is still known in Basque. 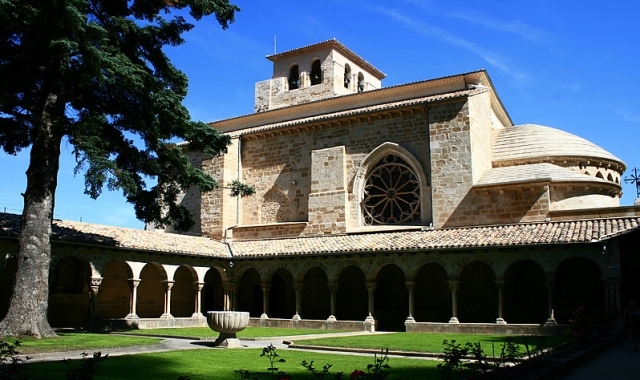 At the end of the XI century, and while configuring the pilgrimage route, the new city of Estella was born to aid the pilgrims by offering the opportunity to stay overnight. With the firm intention to promote the route to Santiago the monarch Sancho Ramirez decided in 1090 that the place would be surround by walls for protection and a castle was also erected. He granted a Charter (privilege), based on that of Jaca, authorizing the installation of francs, allowing certain men an exemption from tax, those considered as stimulating business activity and providing enrichment to the centre. Today, hikers who pass through the cobbled streets of San Pedro, following the ancient Rua of the pilgrims, can recall the origins of this city that emerged for the Camino de Santiago and compare it to the description of Aymeric Picaud, author of Codex Calixtino, made ten centuries ago. Estella is a city of good bread, great wine, plentiful in meat and fish and all kinds of happiness. Its numerous monuments, various services tailored to the hikers and their gastronomic budget will leave them with a good taste. In Estella, beyond the historical visit itself, there are some everyday life pleasures in which the pilgrim can also participate. One of them, very colourful, is the lively Thursday market, which "takes over" the Square Plaza de los Fueros. In terms of festivities in Estella, on May 25th it celebrates a traditional procession of the Virgin of Puy while pilgrims able to visit the city in late July, will find themselves back in the Middle Ages with the celebration of its Medieval Week. The Friday before, the first Sunday of August begins a further seven days of lively celebrations. Among them a notable day is Sunday, when they can attend the procession of the saints, all the men dress in white, with sandals, a scarf and a coloured sash. The religious procession ends with pañuelada, during which the men dance, formally to the rhythm of a march by Wagner, moving between the church of San Pedro de la Rúa and the town hall. During these days visitors can also enjoy the fiesta of the running of the bulls and the famous Dance Baile de la Era, a dance typical to Estella in which couples, dance through different rhythms to the sound of bagpipes and the beat of the drummer. If you are traveling on the Camino de Santiago or are planning to do so soon, you should know that the distance separating Estella from Santiago de Compostela is 663 kilometers.